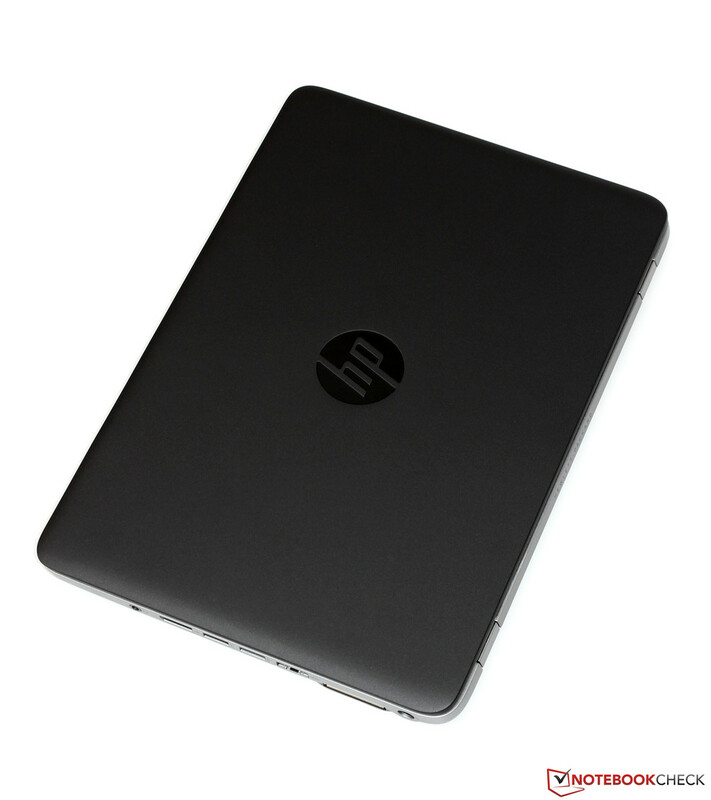 Business users who travel a great deal need both a highly mobile as well as reliable workhorse computer - demands which compact business notebooks like the HP EliteBook 820 G1 are designed to fulfill. 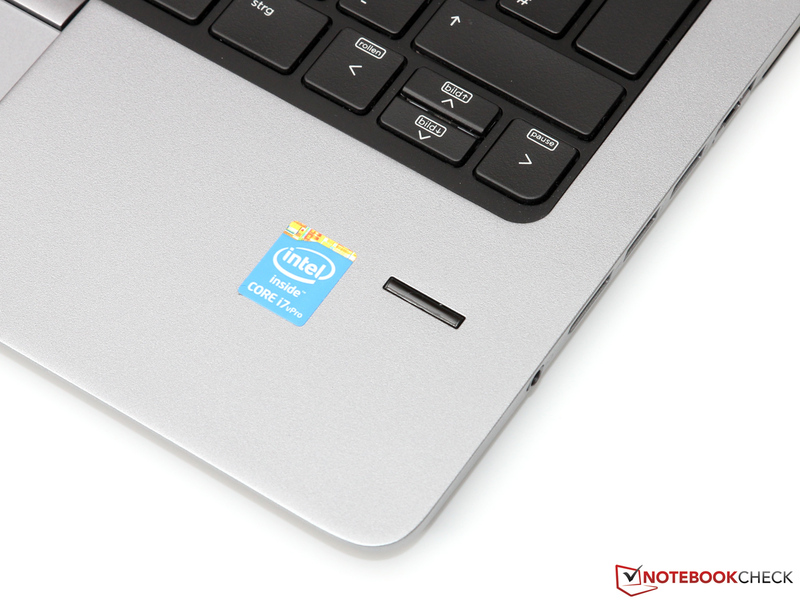 The 820 G1 starts at 1000 Euro (~$1265), which is certainly far from inexpensive, although it is in line with what the competitors Dell or Lenovo charge for similar notebooks. 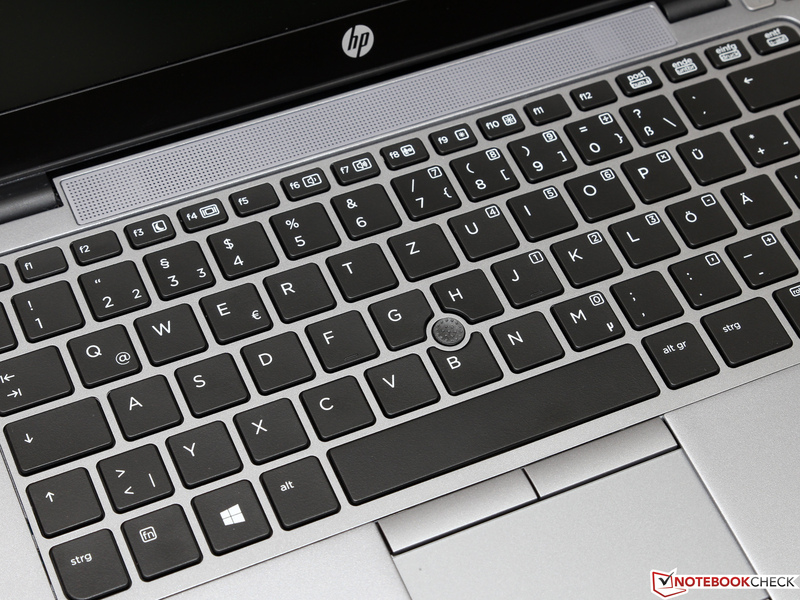 HP promises a less expensive entry into the world of EliteBook models with the new 700-series: equipped with current-generation AMD Kaveri APUs, the manufacturer recently released the slightly less powerful, but somewhat more affordable models EliteBook 725 G2 (12.5-inch), 745 G2 (14-inch) and 755 G2 (15.6-inch). 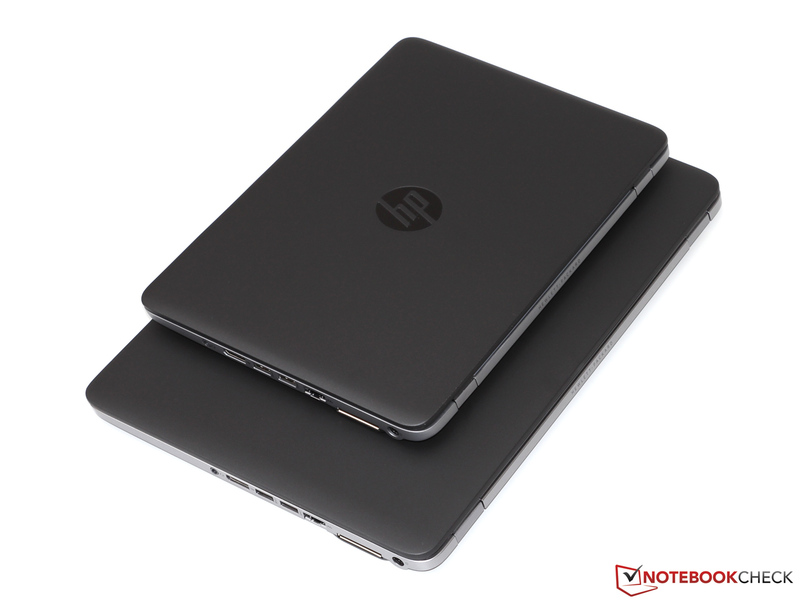 We've already taken a look at the two larger notebooks, so this time around will focus our attention at the 12-inch version. 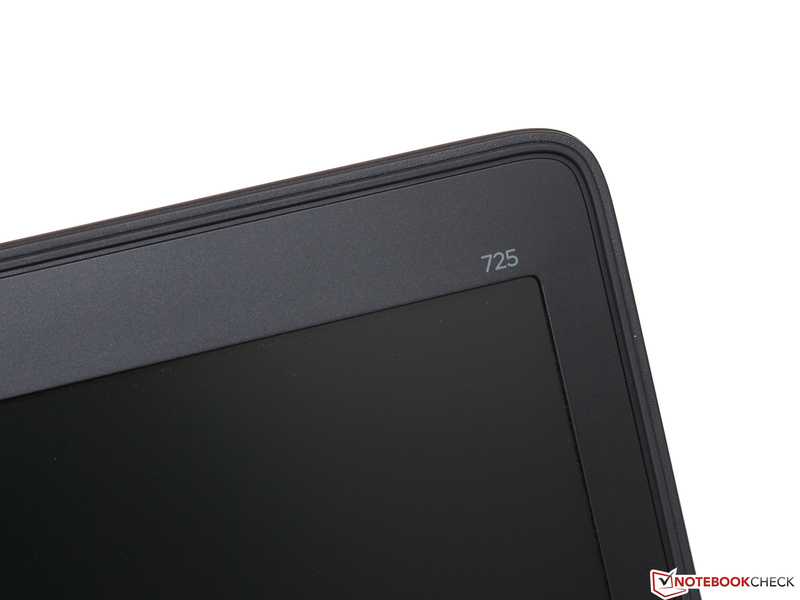 Aside from the smaller display, which unfortunately only offers a resolution of 1366 x 768 pixels, the hardware configuration of the 725 G2 mirrors that of its larger siblings. The base version, which sells for 900 Euro (~$1140), ships with an AMD A10 Pro-7350B, 4 GB RAM and a 500 GB hard drive. Alternatively, the EliteBook can be purchased with FullHD display, SSD and twice as much RAM - with the purchase price now exceeding 1300 Euro (~$1140). That's a lot of money, but still not that bad when compared to similarly equipped Intel notebooks. 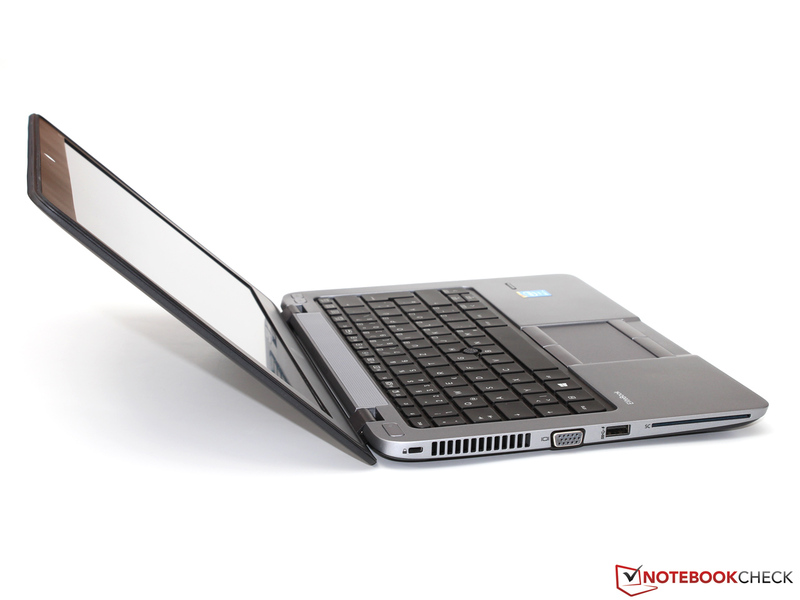 Even though the EliteBook 725 G2 looks almost identical to the 820 G, the two notebooks differ in more aspects than just the manufacturer of the processor. 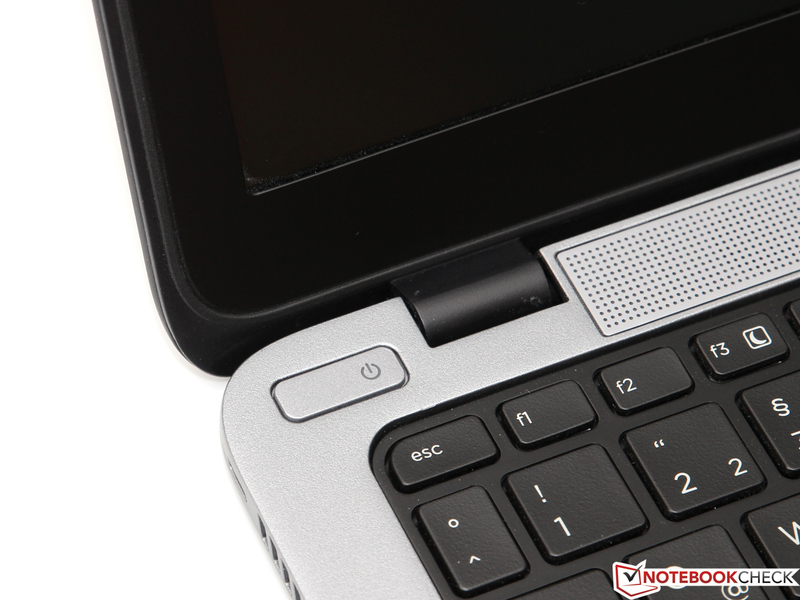 The notebooks in the 700 series are lacking some security features for example, although more important basics like a TPM chip and the fingerprint reader are part of the package. 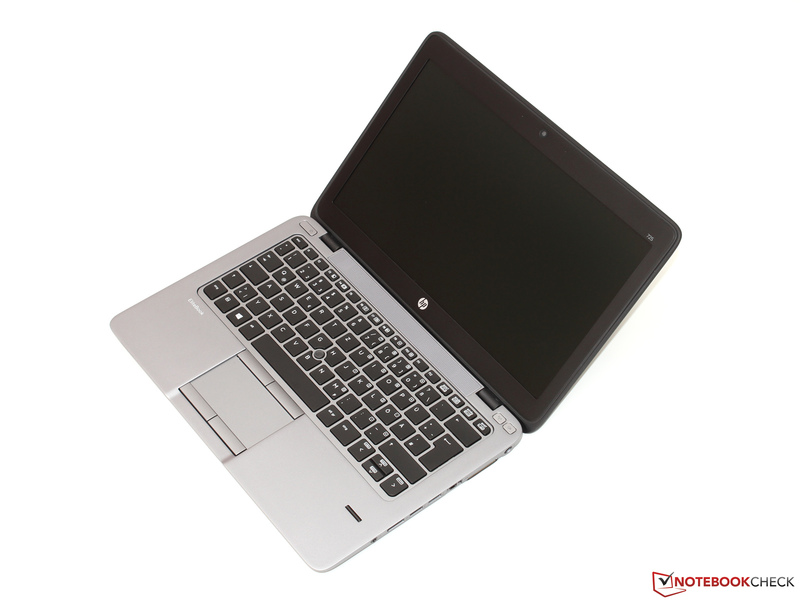 HP also omitted the very useful M.2 SSD slot and the keyboard backlight. Aside from the three areas mentioned above, we couldn't really detect any further differences, so we've omitted a closer examination of the chassis, the input devices, and the port selection. 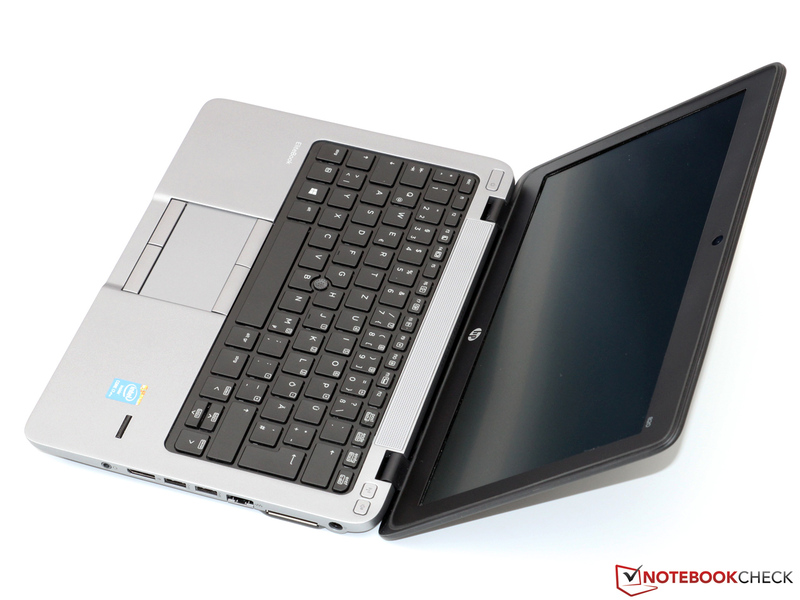 Please check our review of the EliteBook 820 G1 for details. A display resolution of only 1366 x 768 pixels (WXGA) seems pretty antiquated considering we are in the latter part of 2014, but for a 12.5-inch notebook, this is still pretty standard fare. 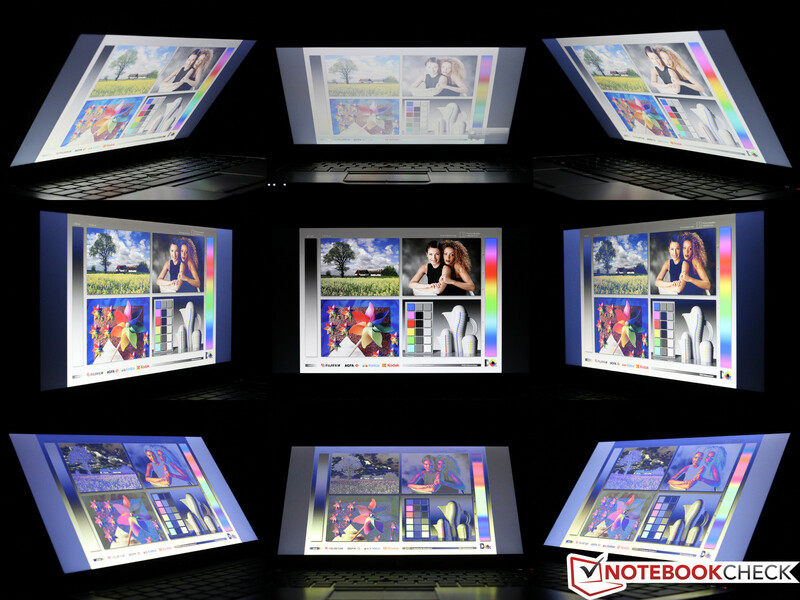 Users looking for a better screen have to opt for the much pricier high-end version of the notebook with FullHD resolution and IPS panel technology. Unfortunately, we couldn't get our hands on this particular model, which has a sharper picture thanks to higher pixel density (176 vs. 125 dpi) and much larger workspace coverage as well. 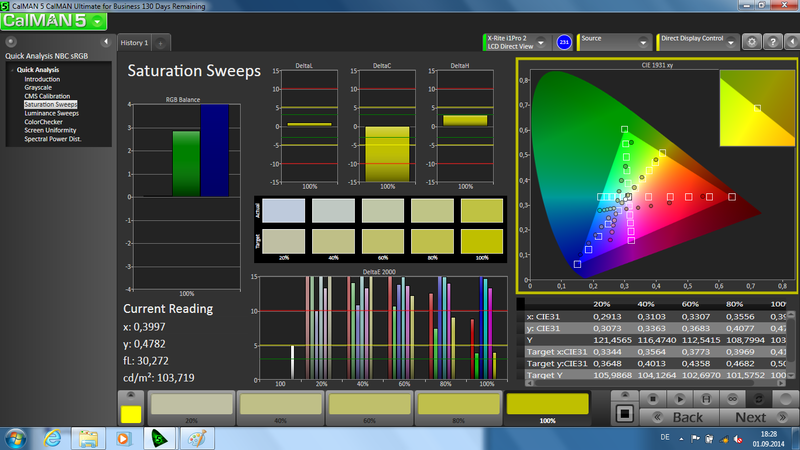 The maximum brightness is also far from overwhelming: 186 cd/m² are simply not enough for this category and barely sufficient for indoor use, as even a bright window behind the user can make deciphering the screen content somewhat difficult. 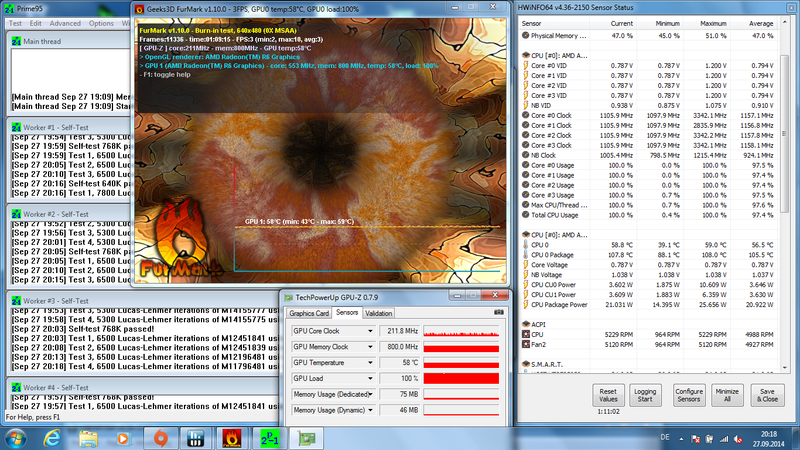 The 820 G1 (211 cd/m²) and the Dell Latitude E7240 (211 cd/m²) suffer from the same problem, although to a lesser degree. The very good brightness distribution of 91 % simply can't make up for the overall mediocre showing. 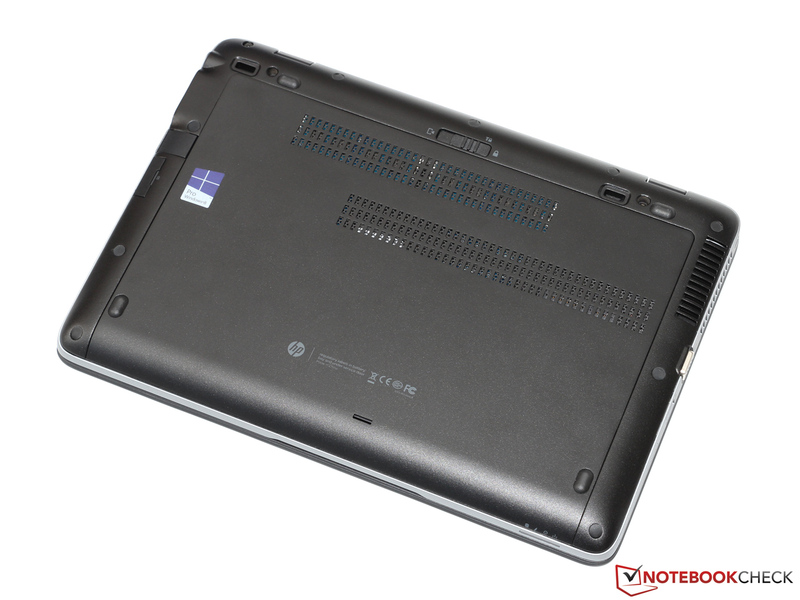 The review notebook doesn't come with a screen from AUO like its sibling EliteBook 820 G1, but makes use of a TN panel from competitor LG instead. 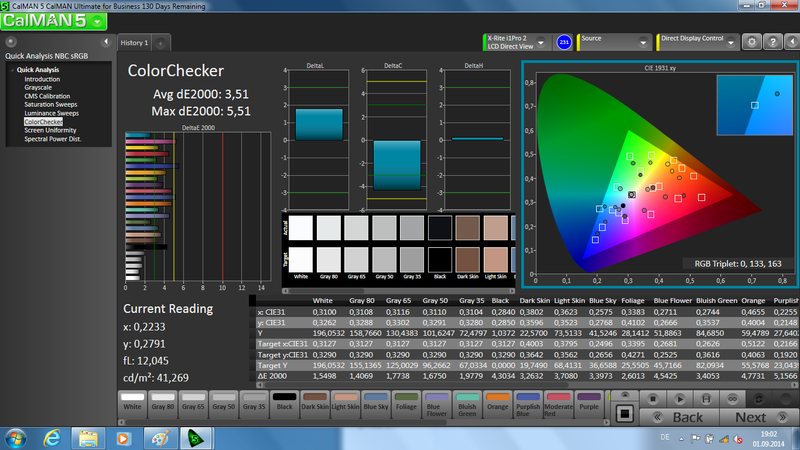 Black value (0.86 cd/m²) and contrast ratio (219:1) are also a step behind the Intel version (0.63 cd/m², 363:1) and are acceptable, but nothing more. Subjectively, the picture is weak and washed out, which is especially a drawback during mulitmedia applications. Office-type applications look just fine, however. The display is plagued by a distinct bluish hue, which of course is something we frequently see these days. 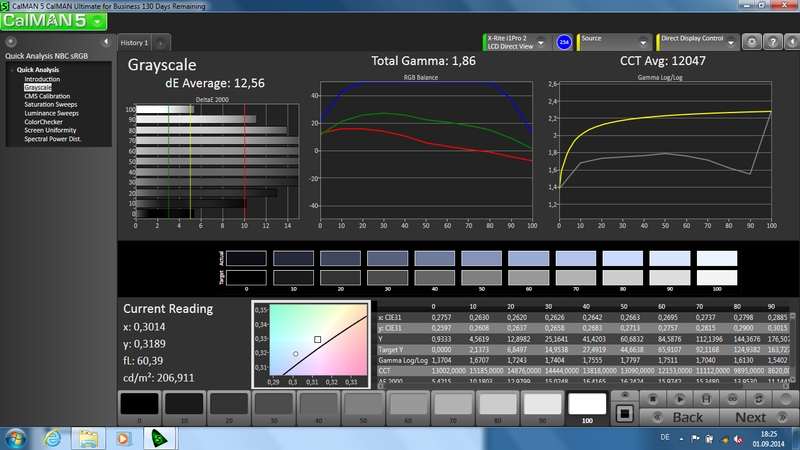 Calibrating the screen does improve the quality and the very high color and grayscale deviations are significantly reduced in the process. 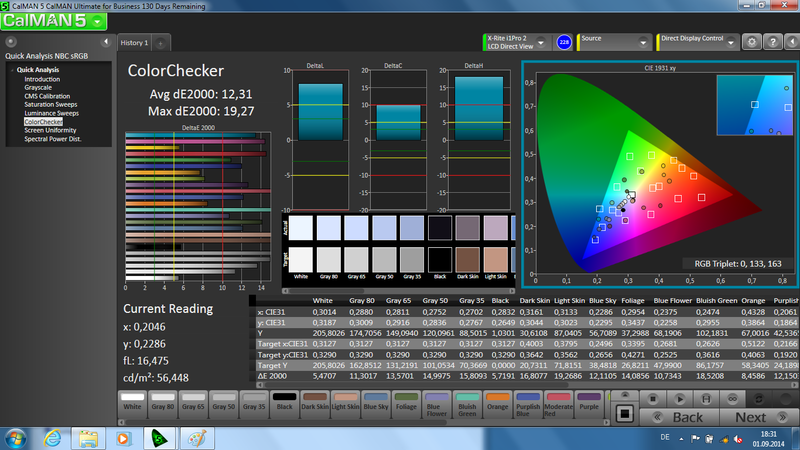 The EliteBook isn't the correct choice for professional photographers and graphics artists, however, as the display doesn't cover the professional color spaces AdobeRGB (39 %) and sRGB (56 %) adequately. 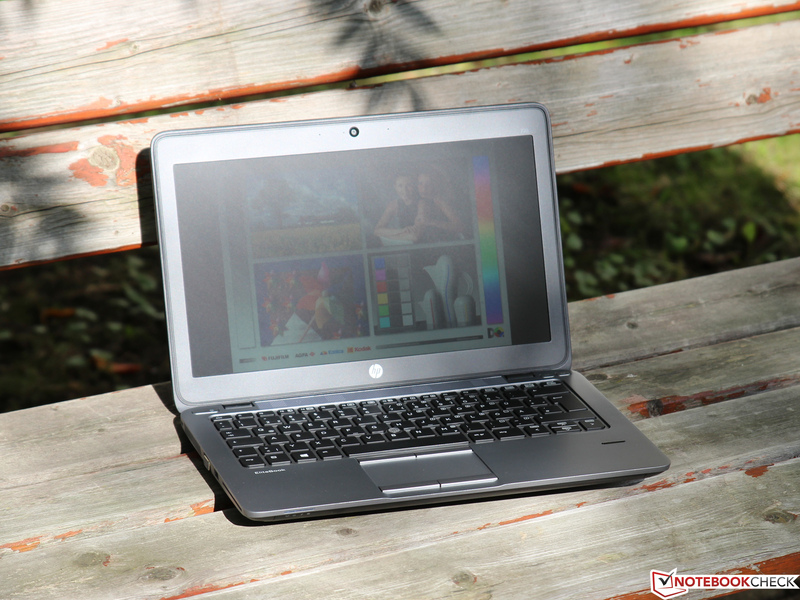 Small and light subnotebooks are generally ideal for outdoor use, but 725 G2 is hampered by a weak LED backlight, which makes working outside very difficult. In direct sunlight, we couldn't identify the screen content despite the non-glare panel. Even in the shade we would have preferred a higher screen brightness. We can only hope that the more expensive FullHD version does a better job here. 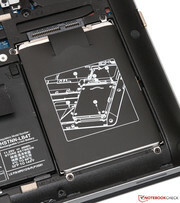 As it is typical for TN displays, the user shouldn't deviate much from a head-on position when working with the notebook. Even small changes in the angle in the vertical plane change the picture significantly: the screen washes out, gets darker, or the colors distort. 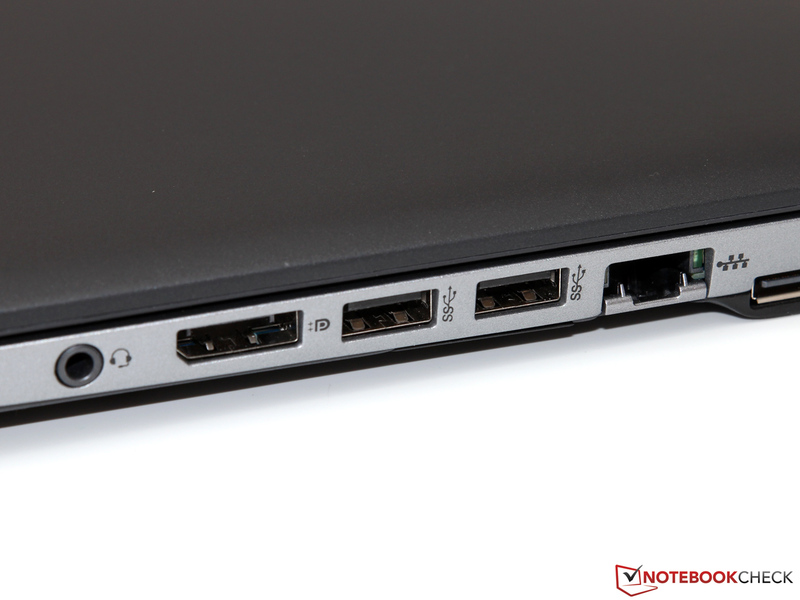 The Dell Latitude E7240 and Lenovo's ThinkPad X240 have similar issues, but just like the EliteBook, they can be configured with an IPS panel which of offers superior viewing angle stability. 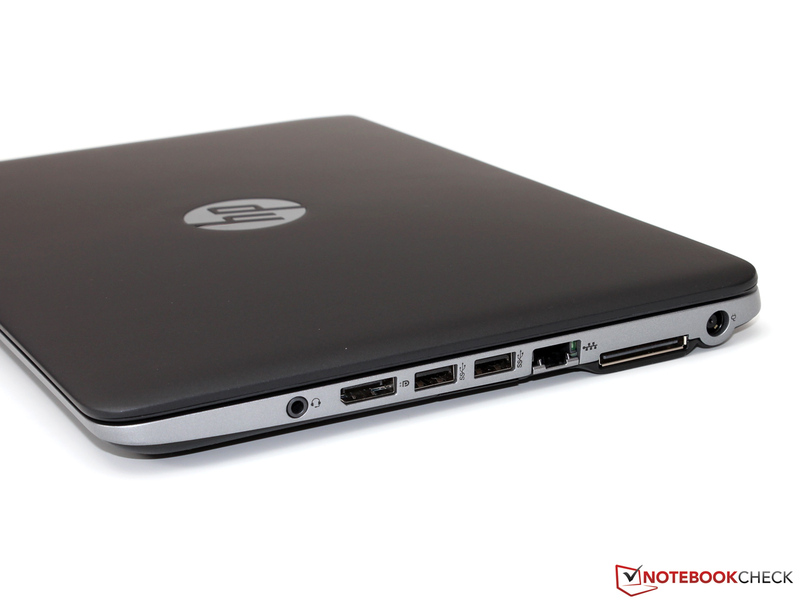 HP uses the AMD A10 Pro-7350B APU not only in the EliteBook 725 G2, but also in the 745 G2 and the 755 G2. 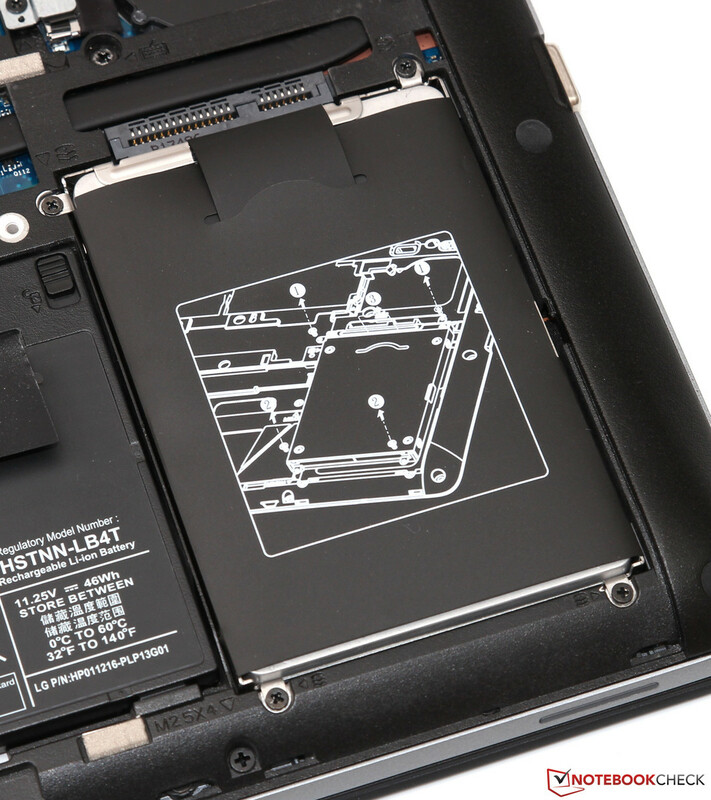 With a TDP of 19 watts, the Kaveri chip is an / a (U)LV processor suitable for very thin and mobile notebooks. Thanks to four CPU cores, which operate at 2.1 to 3.3 GHz, the performance should still be pretty decent, which of course is important given the prowess of Intel's Haswell generation. AMD does have a secret weapon with their Radeon R6, which is supposed to not only outperform other integrated solutions, but even some dedicated GPUs. 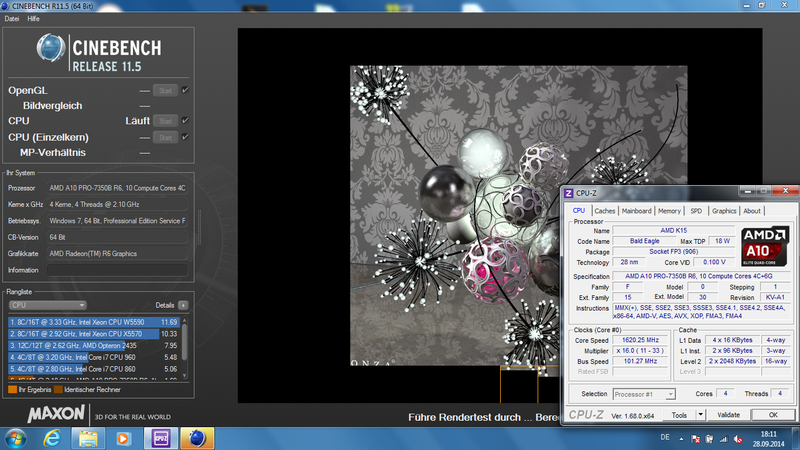 The Radeon does come with an impressive 384 shader units running at up to 533 MHz. 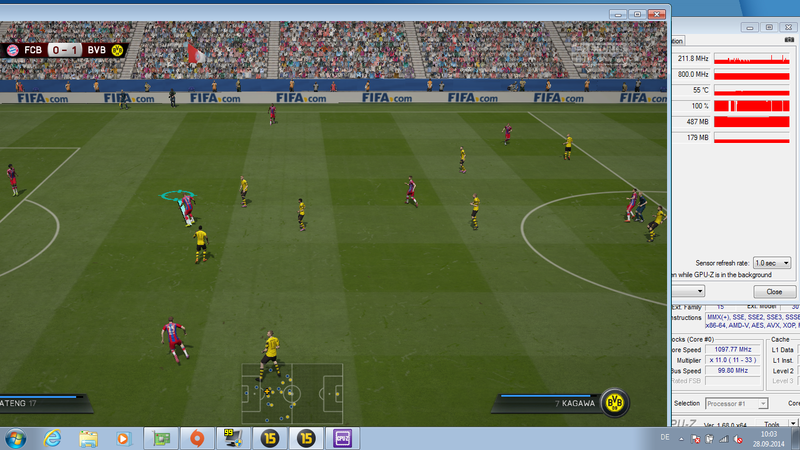 A modern feature set including DirectX 11.2 support and AMDs Mantle API are also part of the package. 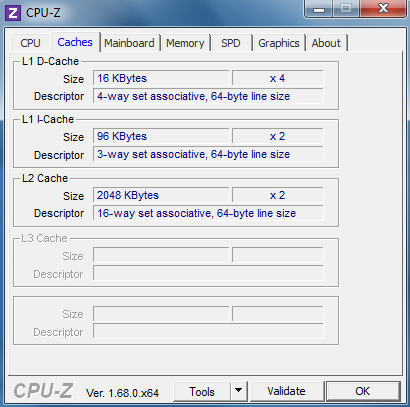 The amount of RAM is far from impressive: a single 4 GB DDR3 1600 module means that the RAM is forced to operate in single-channel mode, which probably particularly impacts the 3D performance. We're also not overly excited about the conventional 500 GB hard drive - but considering the price bracket, we can't really expect a fast SSD here. 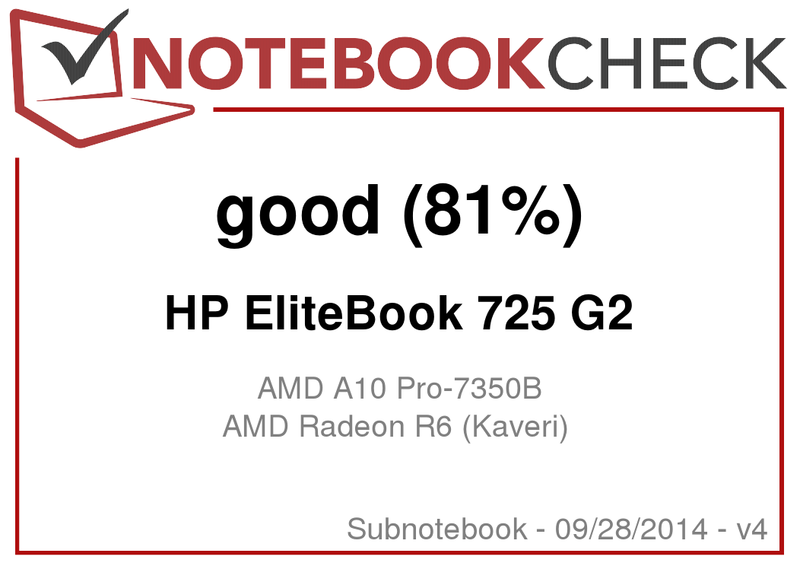 Even though the 725 G2 is equipped with the same APU as the EliteBook 745 G2 and the 755 G2, it scores lower in nearly all benchmark tests. We didn't have a difficult time tracking down the reason: the theoretically possible clock rate of 3.3 GHz is simply not attained in this implementation. 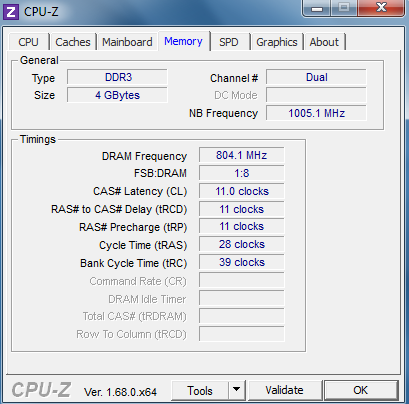 During single-threaded operations, we rarely observed above 2.1 GHz and during the multi-threading portion of the Cinebench R11.5 test, the processor throttled down to 1.6 GHz at times. Maybe HP did this on purpose to keep the temperatures down - but we find it disappointing that the A10 Pro-7350B can't even reach the performance level of the (most likely priced comparatively) Core i3-4030U. The 2.5-inch HGST Travelstar Z7K500 offers a capacity of 500 GB, 32 MB Cache, and operates at a rotational speed of 7200 RPM. Thanks to the comparatively high rotational speed, the drive posted good transfer rates of 96 MB/s as well as a low access time of 17.4 ms. 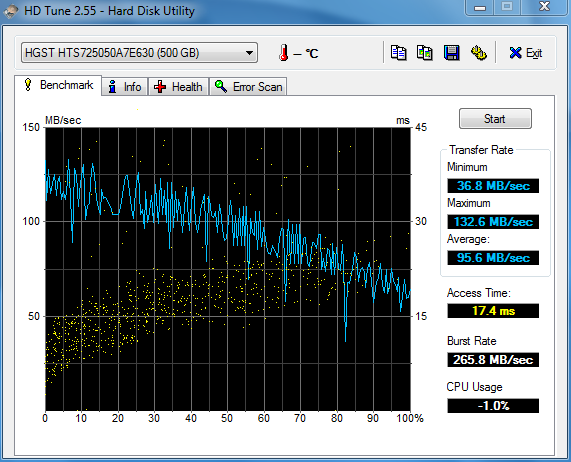 This values are great for conventional hard drives, although even low-end SSDs offer better performance. Swapping out the hard drive for an SSD shouldn't be very difficult; since there is no M.2 or mSATA slot, both types of storage can't be used simultaneously. Despite the rather disappointing showing of the CPU, the overall performance of the system, which comes preinstalled with Windows 7 Professional (although Windows 8.1 Pro is included as well), is pretty decent. The quad-core APU can handle word processing, browsing, and simple multitasking with office-type applications quite well. When running more demanding software, we sometimes wished for a faster processor, especially since the single-threaded performance could really use some improvement. Installation of a SSD or hybrid drive (HDD with flash cache) would shorten the boot times, which is also pretty long at 60 seconds. 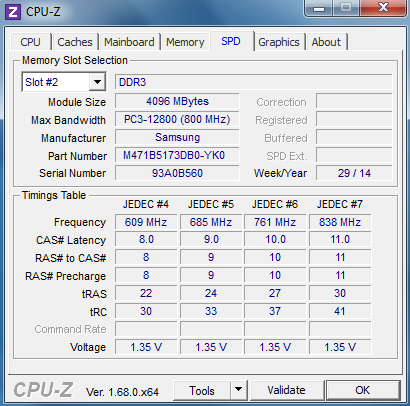 The lack of an SSD also explains the results of the synthetic PCMark test, which are not very impressive, since the speed of the storage device has a huge impact on the score. Although the A10 Pro-7350B lacks a little as far as pure CPU performance is concerned, it should be able to make up some lost ground with its fast graphics unit. Even though the aforementioned single-channel RAM configuration decreases the output of the Radeon R6 by 20 to 30 %, the performance of the GPU nonetheless tops the aging Intel HD Graphics 4400. Compared to other low-end graphics cards, the R6 ranks right behind a GeForce 710M or a Radeon HD 8550M. 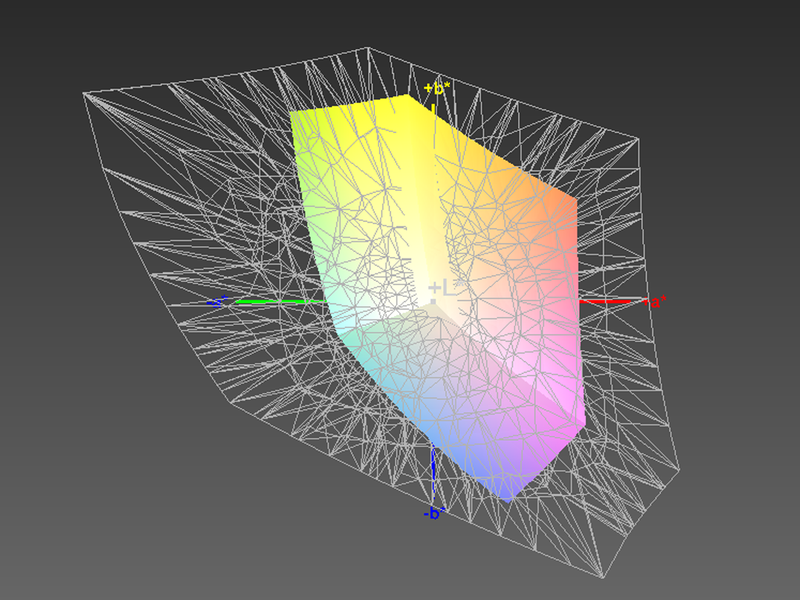 More and more applications don't just use the GPU for 3D effects, but also rely on OpenCL for other purposes. Photoshop, for example, can transfer some filter task to the GPU and spreadsheet calculations in LibreOffice are accelerated that way as well. AMDs GCN architecture can frequently outperform competing solutions from Intel and Nvida for applications that can take advantage of this feature. The fact that most current games are only playable at the lowest settings and XGA resolution shouldn't affect most business users. We were quite surprised, however, how far the EliteBook 725 G2 lags behind the larger 755 G2 - the reduced RAM bandwidth (we tested the 755 G2 with 2x 4 GB) and the decreased Turbo performance of the 12-inch system are the most likely culprits. 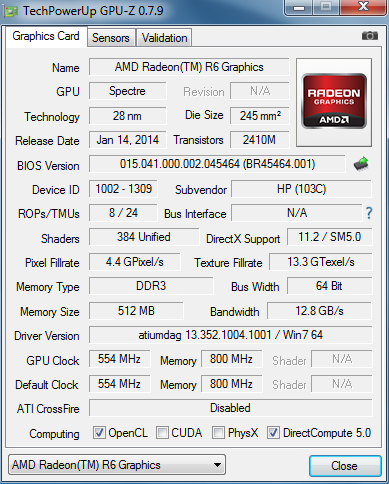 The Radeon R6 sometimes even trails the HD Graphics 4400, which is not something we expected giving the strong performance during the 3DMark benchmarks. 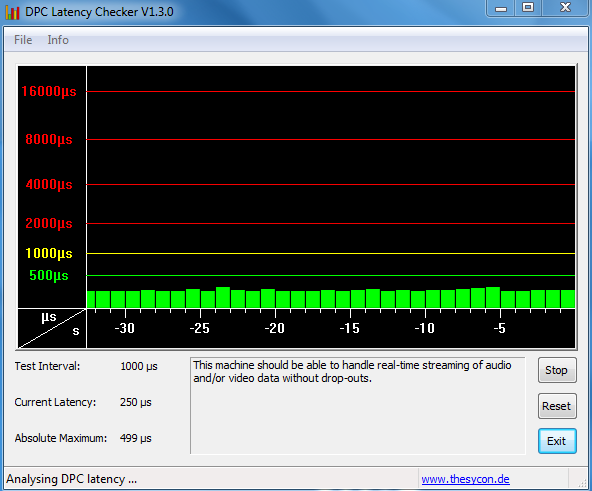 During idle, the 725 G2 is well behaved and almost silent and only really audible because of the fast-spinning hard drive. 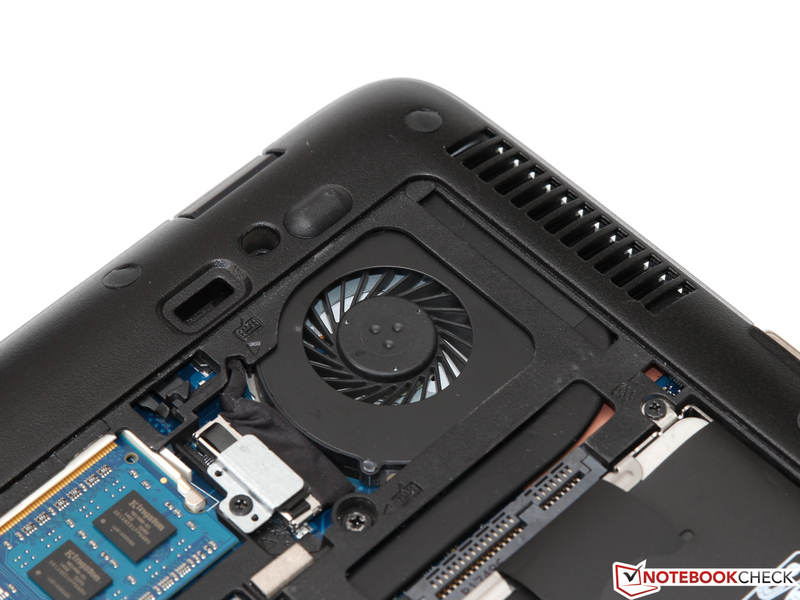 The fan does kick in even at comparatively low load levels, like browsing the web or when playing back HD videos, and the noise increases to about 32 dB(A). This is still very low, but some competing systems don't have resort to fan use at all during many of the tasks encountered on a daily basis. Even when the load increases, the fan RPMs only increase marginally. 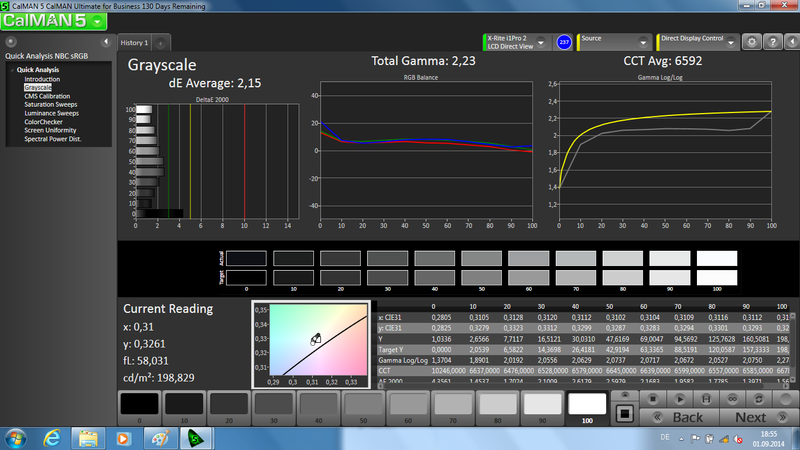 During the stress test, the system topped out at 35.6 dB(A); for most applications, the notebook stays below 34 dB(A). 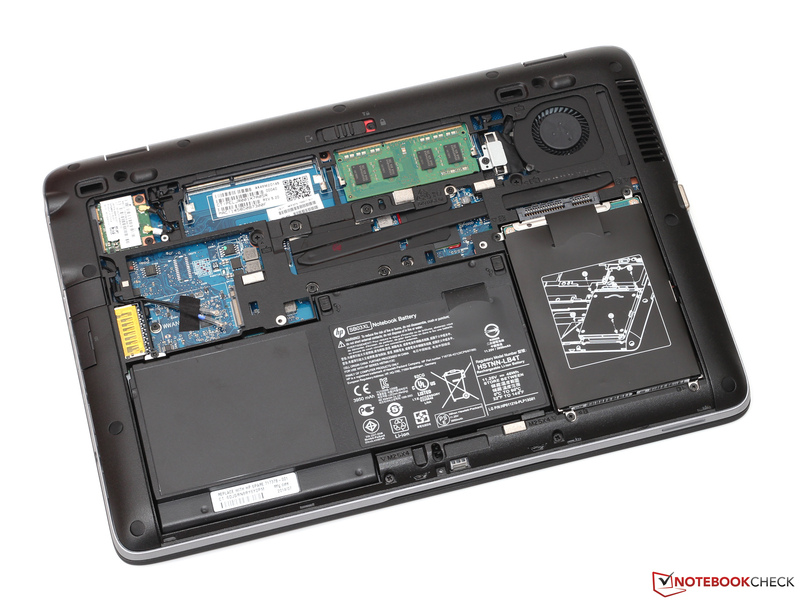 The EliteBook is among the least noisy systems in this category and outperforms the Latitude E7240 as well as the ThinkPad X240 in this area. Since the fan management isn't very aggressive, the temperatures climb rather quickly: even during rather simple tasks, the chassis heats up to above 30 degrees C; under maximum load, we measured 40 degrees C and above. Of course, users are not going to encounter high temps like that under normal conditions and since the hotspots are all at the rear, they aren't really of any consequence. 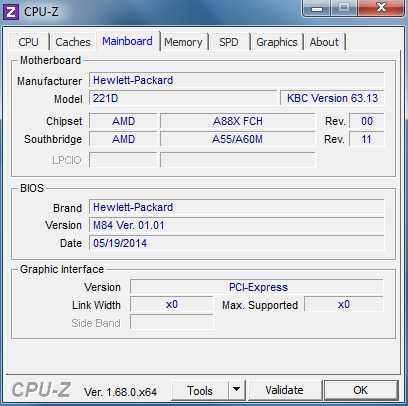 We would love to praise HP for the extremely low hardware temperatures, since the Kaveri APU tops out at only about 59 degrees. Unfortunately, these temperatures are the result of the heavy throttling, which affects both the CPU (1.1 GHz) and the GPU (211 MHz). This throttling doesn't just occur under extreme conditions like the stress test with Prime95 and FurMark, either: even normal daily tasks can result in a decrease in performance when the CPU and the GPU are under load simultaneously. 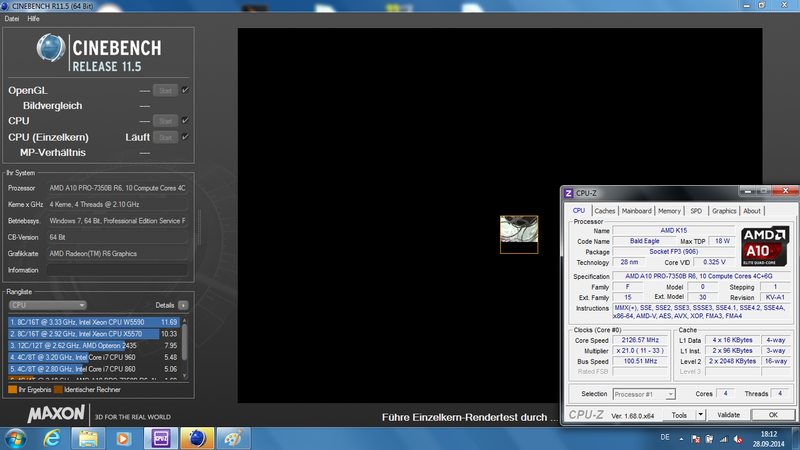 A glance at the power consumption reveal the reason for the fairly high observed temperatures even during idle. 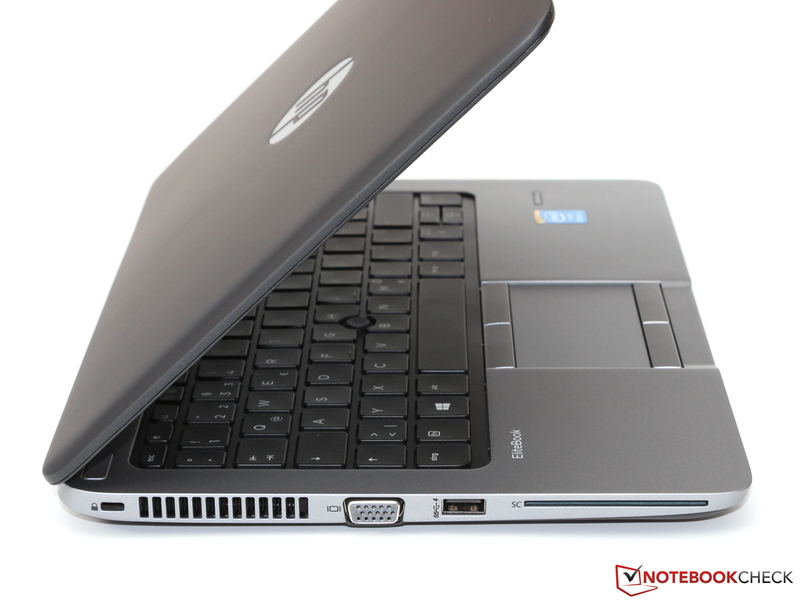 With a draw of 7.0 - 9.8 watts, the EliteBook 725 G2 requires quite a bit more power than the 820 G1 (3.2 - 7.5 watts) or the Dell Latitude E7240 (3.7 to 6.6 watts). The difference between our review model and the Intel-equipped sibling are most likely a directly consequence of the CPU platform - Haswell is in a league of its own when it comes to efficiency. Under load, the 725 G2 is astonishingly frugal. We measured a maximum power consumption from 24.4 (3DMark06) up to 32.5 watts (stress test; after a short period 26.4 watts). This means that the A10 Pro-7350B stays below the theoretical TDP threshold even when the hardware temperatures are far from critical, which in turn explains the throttling. Although the capacity of the battery (46 Wh) is decent, the EliteBook is no match for the competitors as far as the battery life is concerned. 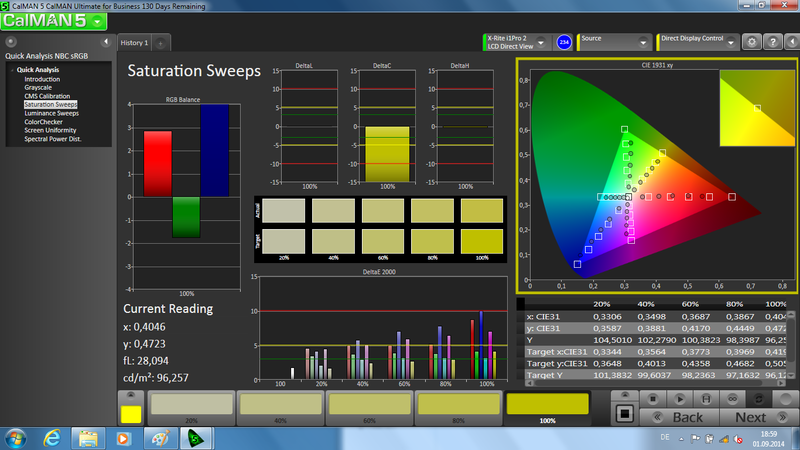 With wireless activated and the display adjusted to 150 cd/m², our web browsing activities ended after about four hours. 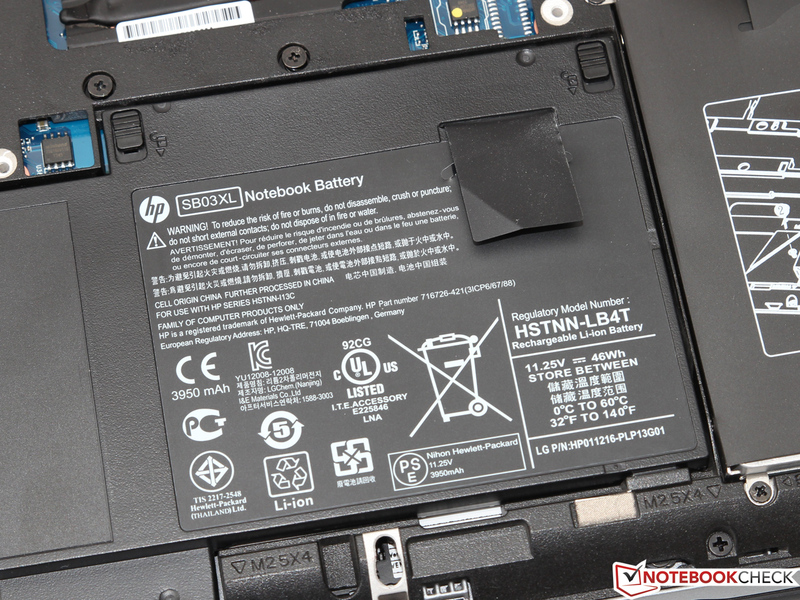 Even the Latitude E7240 does better here despite its significantly smaller 31 Wh battery. 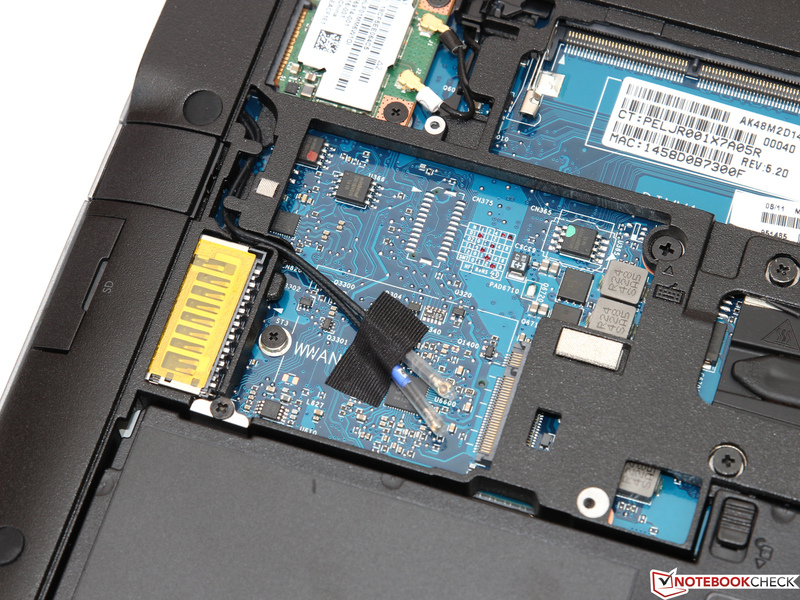 The Lenovo ThinkPad X240 (63 Wh) is the undisputed leader with a run time of almost eight hours. Again we need to point out the differences between the 725 G2 and the 820 G1, as the less expensive AMD variant can only hold its own during the Battery Eater Classic Test (high performance profile, maximum brightness, wireless on) - but only because of the troublesome aggressive throttling. 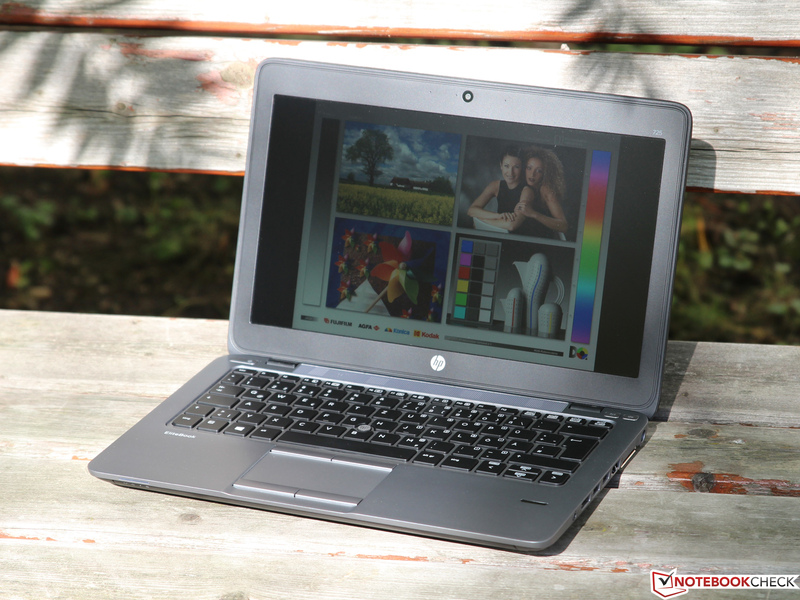 Potential buyers who might have hoped that the HP EliteBook 725 G2 is a somewhat comparable, but much more cost effective alternative to the likes of the 820 G1, Dell Latitude E7240, and Lenovo ThinkPad X240, will likely be disappointed. Our impressions from when we reviewed the larger siblings remain unchanged and AMDs long-awaited Kaveri platform simply can't live up to the high expectations. 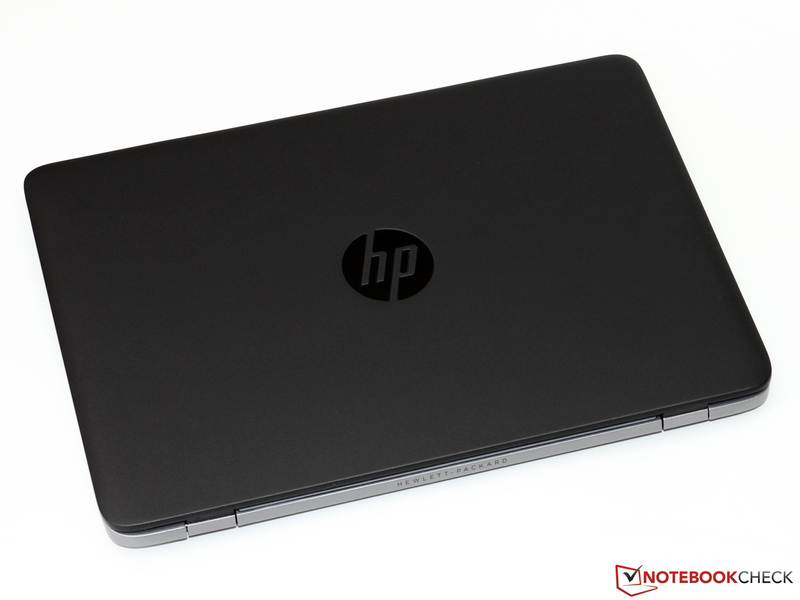 Part of the reason might be this particular implementation, as the power consumption, noise level, and measured temperatures show that HP's focus probably wasn't on maximum performance. 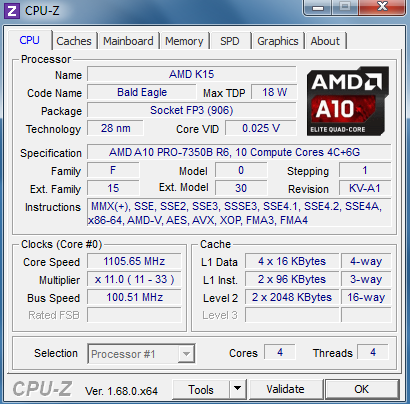 We suspect that the A10 Pro-7350B APU is capable of better performance, but only if it could actually reach the design TPU during operation. Since we observed strong throttling instead, the APU is less powerful than the current Core i3 CPUs and suffers from fairly mediocre battery life to boot. 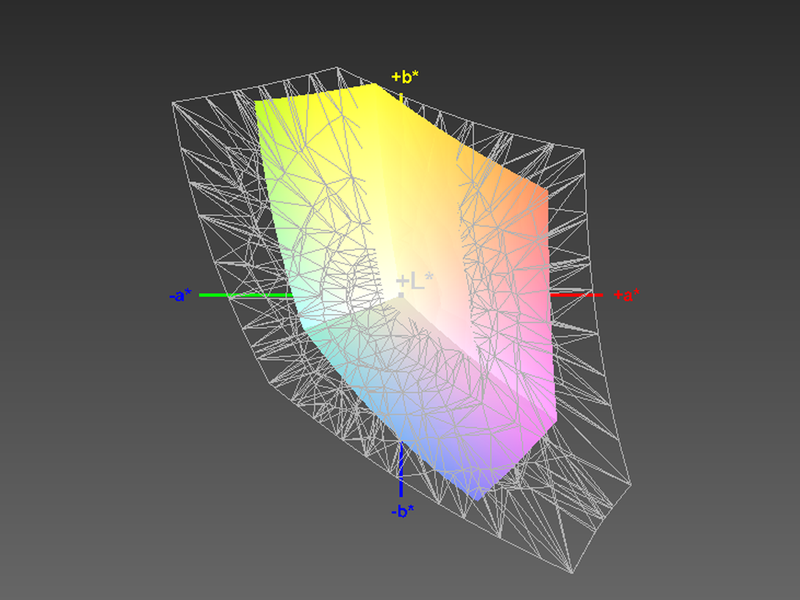 We wouldn't do the 725 G2 justice if we didn't also mention its positive aspects. 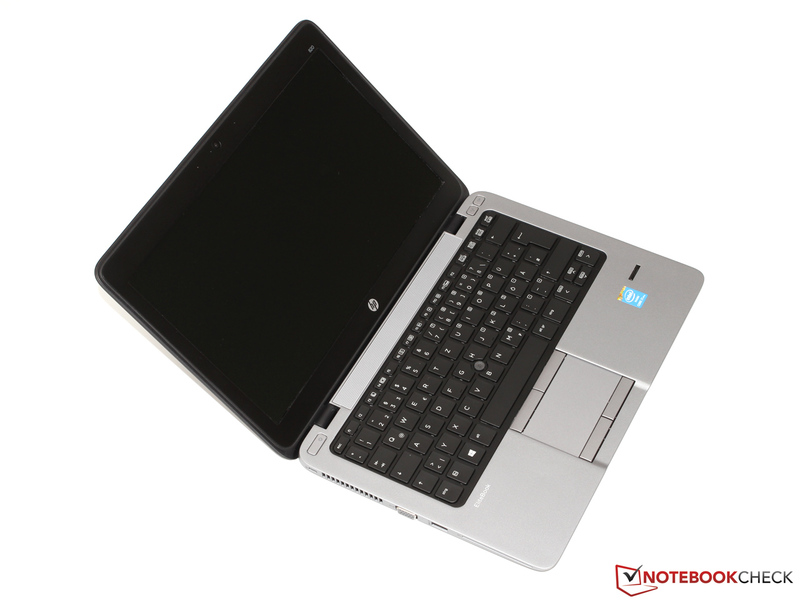 First and foremost, we do need to emphasize that not all users need top performance or extra run time - and the notebook is certainly able to handle the typical office tasks without any issues. The other qualities - no matter if we're talking about the workmanship, the input devices, or the port selection - also stack up quite well. We are really not satisfied with the quality of the display, but would expect the FullHD panel, which of course carries a price premium (and is only available with a different storage and RAM configuration), to be significantly better. 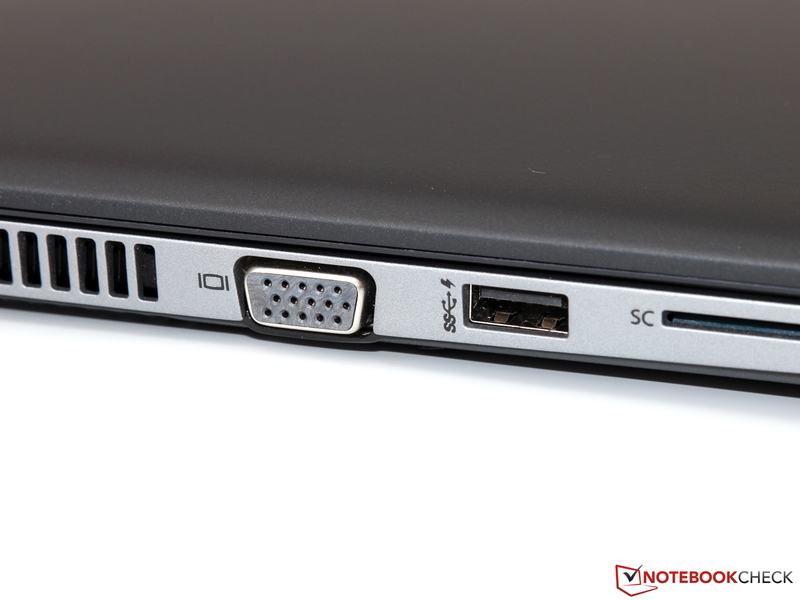 If the shortcomings of the notebook compared to the EliteBook 820 G1 are worth the savings of around 100 Euro (~$125) is something that remains up to the prospective buyer. ...to be suitable as a mobile companion for business use (some photos show the 820 G1). 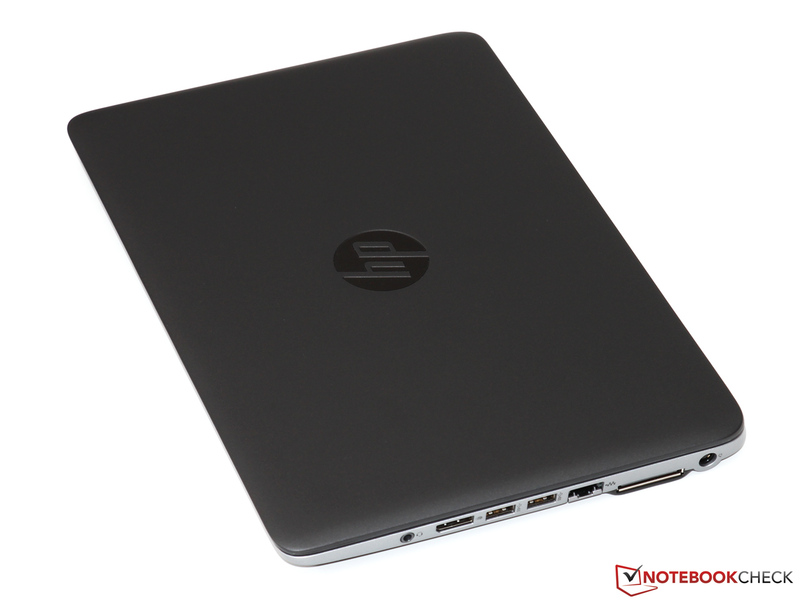 The solution: a 12-inch notebook like the HP EliteBook 725 G2. ...and easily fits into even small bags. ... and sells for around 900 Euro (~$1140). 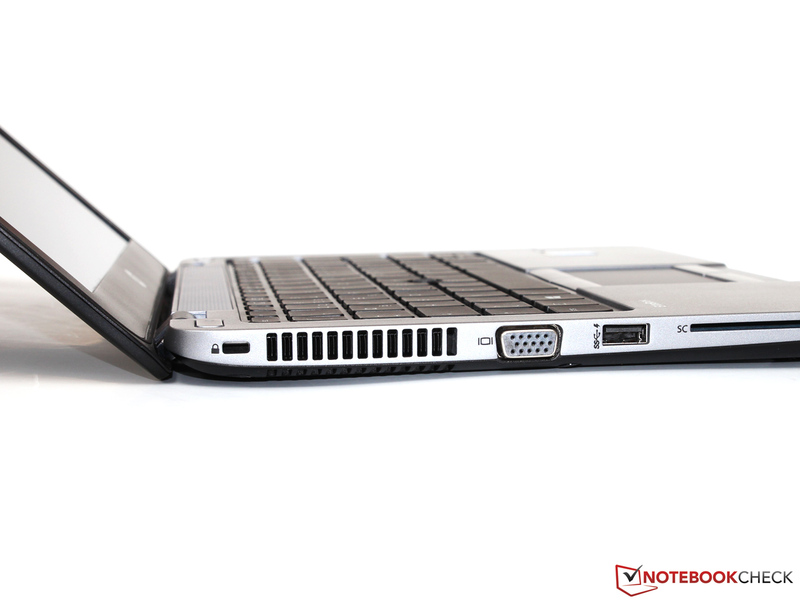 ...like the EliteBook 755 G2, for example. 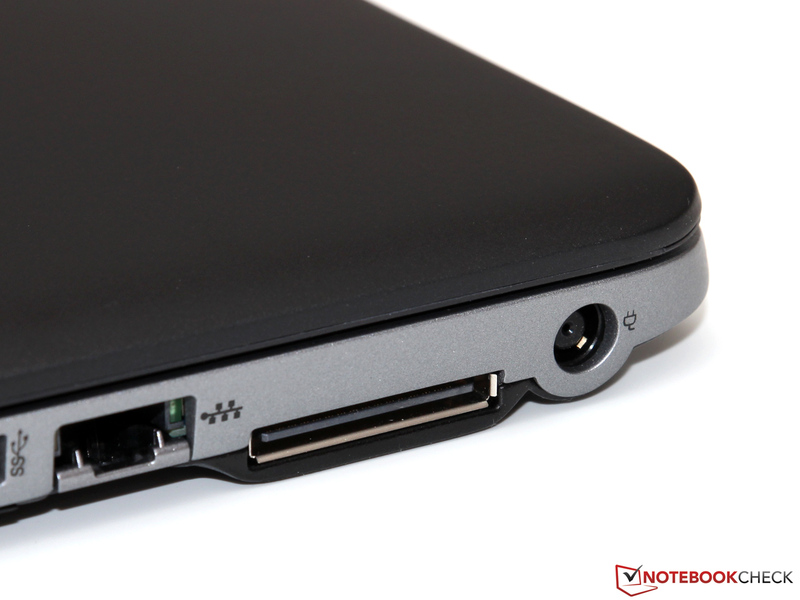 A connector on the side allows hooking up a docking station. 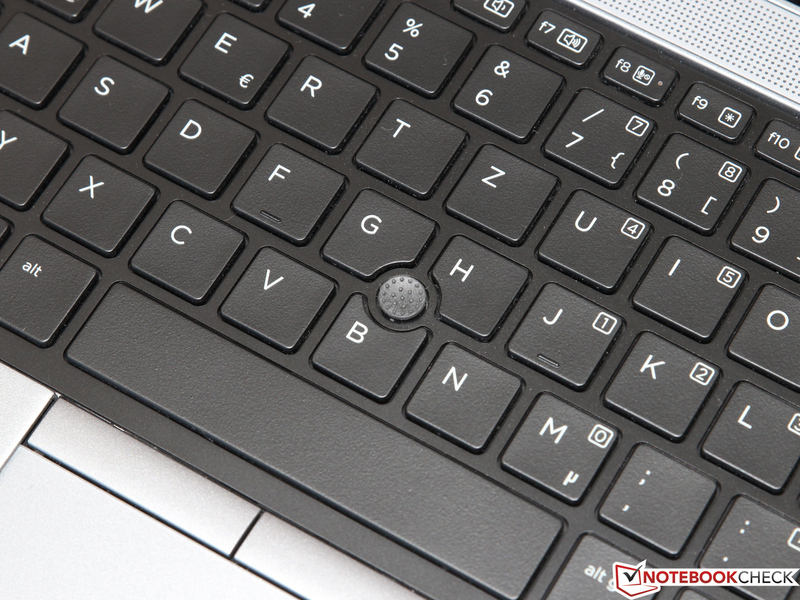 ...and the keyboard are very precise and operate without lag. SC reader and the fingerprint reader are business features. ...lo gain access to the inside. 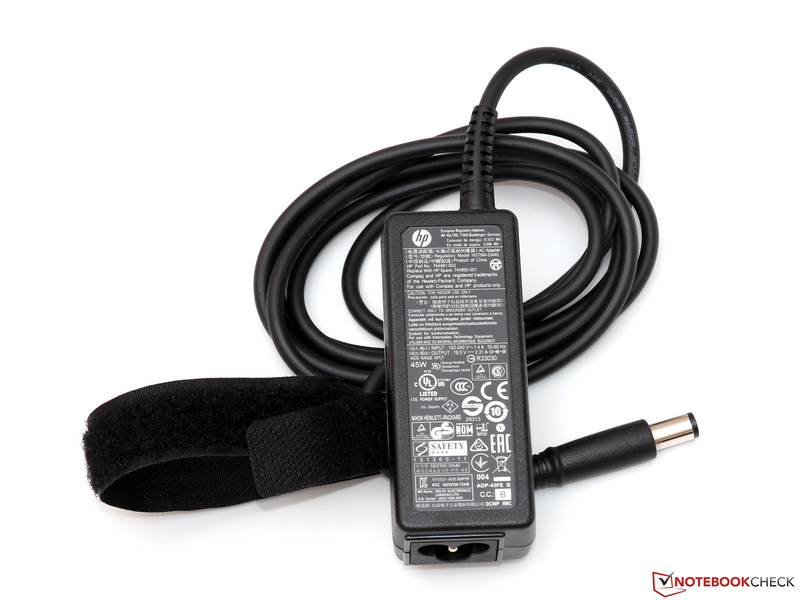 The battery is built-in, but can be removed without any tools. ...and a 45 watt power adapter provides the juice. 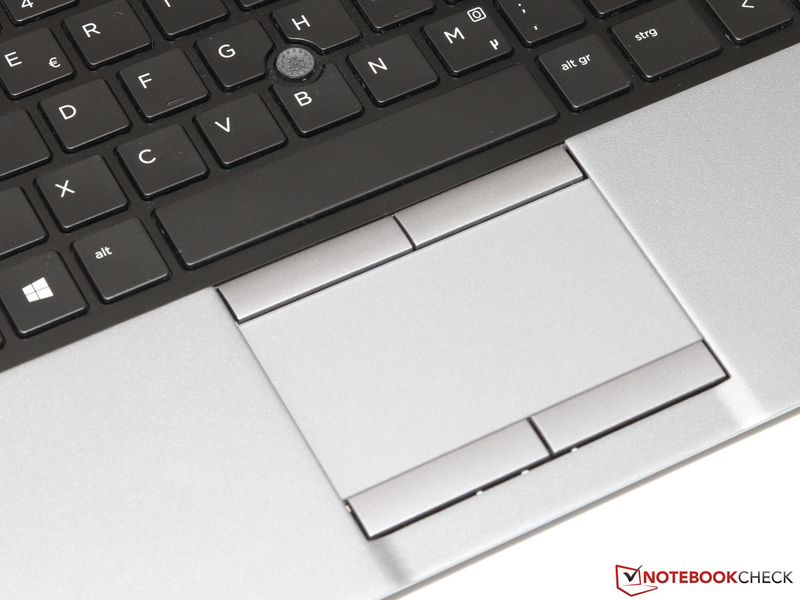 As far as the suitability for office-type tasks is concerned, the 725 G2 deserves its "EliteBook" name tag. Business notebooks featuring the same level of craftsmanship are hard to find under 1000 Euro (~$1250). 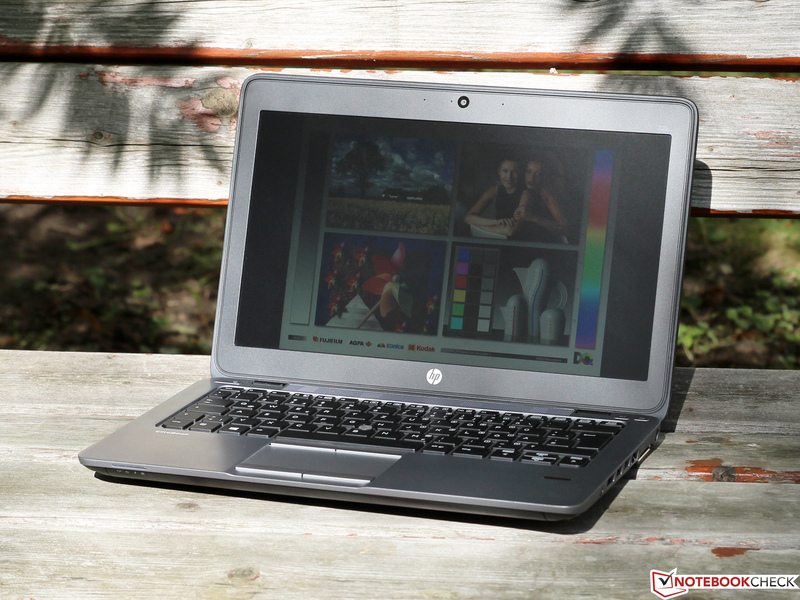 A brighter display with a higher resolution is on top of our list. Although there is that option, the only model that comes equipped as such is the top of the line version, which has more potent hardware as well and is a lot more expensive. Because of the surprisingly low power consumption under load, we suspect that HP is throttling the performance of the quad-core AMD APU. 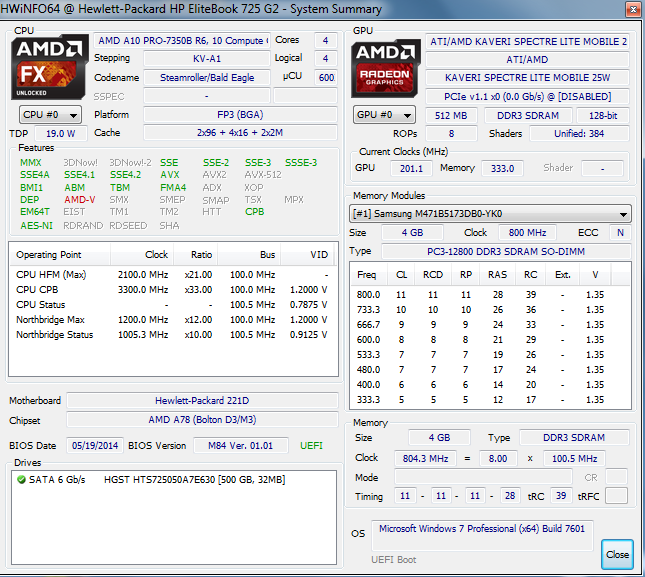 The A10 Pro-7350B therefore can't live up to its potential.